"...In this retro serial-killer entertainment, which I've long thought of as a fusion of "Downton Abbey," Gilbert and Sullivan, Agatha Christie and "Dexter," an impecunious but enterprising young man named Monty Navarro (Andres Enriquez) finds himself to be a far-removed heir to a potential aristocratic fortune, and thus he sets about murdering everyone he finds above himself in the line of succession." "...Porchlight Music Theatre's relocation to the Ruth Page Center for the Arts, where the company became a resident in 2018, may not be the direct cause of its current surge in quality. But the two certainly correlate. Between last fall's revelatory revival of the classic musical "Gypsy," starring E. Faye Butler, and its sparkling Chicago premiere of the more recent Broadway tuner "A Gentleman's Guide to Love & Murder," Ruth Page has hosted what might be Porchlight's most polished and confident back-to-back productions in the 17 years I've been seeing them." "...Crowle's shifty-eyed charms only make it that much funnier to see his characters go splat, plunk, and kaput. His turn as the philanthropist Lady Hyacinth D'Ysquith is especially unhinged and delightful. He's the first among equals here: the singing in this Porchlight Music Theatre production is pretty much superb across the board and Enriquez gives a passionate performance. It's the chameleon Crowle's parade, though; when he gets going, even his scene partners stop and stare. Steven Schellhardt directs, with musical direction by Andra Velis Simon." "...Unlike its cheaper incarnations, however, this is no one-note stunt show. Freedman and Lutvak's vigorous score hearkens to the vaudeville, music-hall and operetta—think Gilbert and Sullivan—of the play's period ( footnoted by music director Andra Velis Simon's selection of authentic Gilded Age-tunes for pre-show and intermission ). Andres Enriquez, Emily Goldberg, Ann Delaney and a high-stepping ensemble ensure that our ambitious protagonist, the women who love him and cohorts thereof, are never eclipsed by Angela Weber Miller's Victorian fold-out scenery, Anthony Churchill's Monty Python-esque projections and Jeff Hendry's foamy wardrobe recalling the iconic images of Charles Dana Gibson." "...A Gentleman’s Guide has the same source material as the 1949 film Kind Hearts and Coronets, and borrows as casting conceit from it: Every member of the D’Ysquith family is played by the same actor, Matt Crowle. It’s less a showy role than a whole show unto itself, and Crowle plays it to the hilt, conjuring laughs from thin air on top of the many punchlines gifted him in the script. But the production’s secret weapon is Enriquez’s megawatt smile: a grin that morphs from wide-eyed to maniacal as Monty spills buckets of blood but never loses an ounce of audience sympathy. Forget murder most foul—this is murder most fun." "...It's a tour de force times ten as Monty Navarro, distant heir to the D'Ysquith fortune, slaughters his way to an earldom and marriage, for better or worse, with a doting cousin. A romp where vengeance gets served up hot and cold, A Gentleman's Guide to Love & Murder is convulsing the Ruth Page Theater in this unstoppably hilarious revival. On opening night Stephen Schellhardt's hilariously stylized staging defied subzero temperatures to warm a very receptive audience for Porchlight Music Theatre's latest triumph. What I wrote about a touring version remains the bedrock low-down on this scrumptious musical transformation: Serial killers can be fun." "...Porchlight Music Theatre has done it again! Despite the chill outside last night, a full house made it to The Ruth Page Center for the Arts to view the opening night performance of "A Gentleman's Guide to Love & Murder", a whimsical musical with book and lyrics by Robert L. Freedman and lyrics and music by Steve Lutvak., that won the Tony Award for Best Musical in 2014. It is indeed a charming story, based on the book, " Israel Rank: The Autobiography of a Criminal" by Roy Horniman and the film of 1949 "Kind Hearst and Cornets" that starred Sir Alec Guinness ( one of Britain's finest character actors)." "...There is much to enjoy in director-choreographer Stephen Schellhardt's production. The projection designs by Anthony Churchill are such fun that we don't care that we can't have castles in the intimate Ruth Page Center auditorium. Emily Goldberg (Sibella) handles the operatic necessities with ease while playing the passive-aggressive coquette. Caron Buinis (Miss Shingle) is gruff, scary and utterly endearing as the family friend who knows where the evidential birth certificate is hidden. Carrying both the weight of the D'Ysquith family and Mays' original performance on his slight shoulders, Matt Crowle does yeoman work, and is particularly successful with his less shouty characterizations. The busy ensemble was excellent throughout. Sharriese Hamilton stopped the show while angrily eating nonexistent food in a sexual frenzy; moments such as these cannot be had for a price." "...Not even the force of a polar vortex could deter the performers and audience as Porchlight Music Theatre opened its altogether bravura production of "A Gentleman's Guide to Love & Murder" this week. And maybe that's simply because this brilliantly conceived and equally brilliantly performed show was meant to defy the odds on every count." 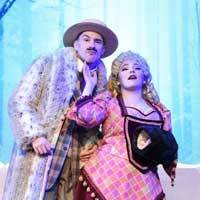 "...There’s so much to recommend in this wonderful, waggish and whimsical production. There’s romance, intrigue, lovely songs and beautiful sets and costumes. The pace is energetic and Stephen Schellhardt’s spot-on direction never disappoints. With a cast of brilliant theatrical artists, including a terrific ensemble, all at the top of their game, this much lauded musical is an evening of finely-honed musical comedy, with a capital C."
"...A GENTLEMAN’S GUIDE TO LOVE & MURDER is bloody brilliant! It is equal parts lampoon and harmony. At the end of the show, my friend Carrie, a Broadway theatre goer, asked me in delighted surprise, ‘These are all Chicago actors?’ ‘YES!’ was my emphatic response. Porchlight Music Theatre is a sure bet for a fantastic musical experience." "...It’s probably not anyone’s immediate thought for a laff-a-minute musical comedy, but the piece enjoyed a boisterous reception on a positively frigid Tuesday night. Like Monty Navarro himself, it’s the last one you’d expect. And if that isn’t comedy, drop dead." "...The longer I write theater reviews, the more familiar I find myself becoming-at least via playbills-with the talent overflowing from Chicago's stages. What's more, I figured it would only be a matter of time before I started seeing the same actors pop up in new productions. (It's a credit to this theater-crazed city that so much talent is willing to work here for a pittance of a living.) So it was no huge surprise when I realized I recognized two actors in Porchlight Music Theatre's new presentation of the multiple Tony Award-winning A Gentleman's Guide to Love and Murder, a thoroughly wonderful musical comedy about an average Joe in line for an earldom and the lengths he'll go to get to the top of the list." "...With music by Stephen Lutvak, lyrics and book by Robert L. Freedman, and music directed by Andra Velis Simon, the entire cast’s singing, dancing, and acting with phenomenal accents makes the audience feel like they’re in England." "...Played more seriously and on a different scale, this play could have turned into an upper-class Sweeney Todd, but writers Robert L. Freedman and Steven Lutvak base their approach on a 1907 novel by Roy Horniman and the film adapted from that book, 1949's Kind Hearts and Coronets, in which Alec Guinness played the entire wealthy family. They balance our focus between the love stories and murders, and the caricatured upper-class setting also carries this unusual farce to comic extremes. The bottom line is that it is a lot of fun, even on a night when temps reached deep into negative numbers." "...The small in numbers cast plays much larger than it is with over 80 magnificent Jeff Handy costume changes and loaded with singers and dancers who play multiple roles featuring Rachel Klippel (Miss Barley) and Michael Reyes (Chief Inspector Pinckney), with Megan Elk and William Dwyer. And while everyone has their hands in this delectably comic pie, Sharriese Hamilton's Lady Eugenia stands toe-to-toe with Crowle's Lord D'Ysquith at the dinner party in a comic confrontation that is one of the most hilarious sequences you will ever see. " "...As a musical with one man playing all the members of one family, Gentleman's Guide is very aware of itself. From the paranoid Lord Asquith D'Ysquith, to the adventurous Lady Salome D'Ysquith Pumphrey, and the quiet, timid Hery D'Ysquith, Matt Crowle plays each D'Ysquith family member with distinct physicality and characterization, which in this writer's view is certainly no easy task. Director and Choreographer Stephen Shellhardt, Associate Director and Choreographer Aubrey Adams, and their artistic team take full advantage of those larger than life, clever opportunities for moments of physical comedy and reveals." "...Director/choreographer Stephen Schellhart, as well as associate director and co-choreographer Aubrey Adams, have worked hard to keep the movement of the ensemble synchronized and precise. As a result, nearly all the jokes land with pinpoint grace. In addition, there are so many patter songs in this show that it is almost a patter musical - and music director Andra Velis Simon has clearly worked with the actors to keep enunciation at the forefront of their work while still allowing their natural singing voices to shine through."